The Texas Mile isn’t for people who like calm weekend drives. It’s an event where cars can run flat out for four times the length of a quarter mile, where a 2006 Ford GT went nearly 294 mph once, and where the 200-mph club is an honor. 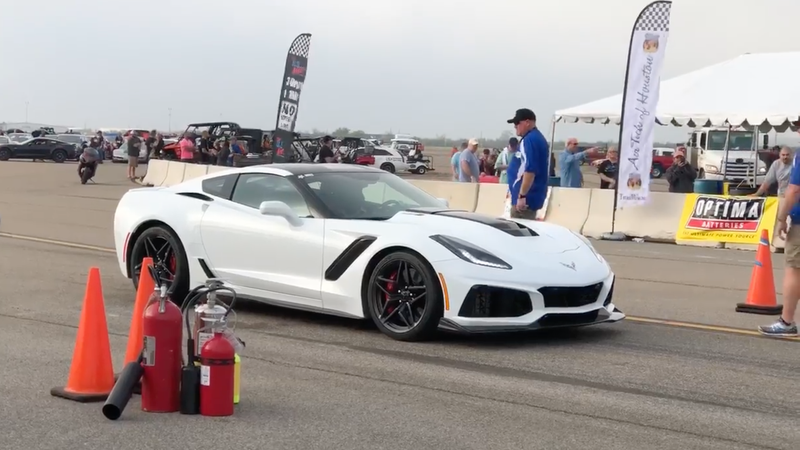 This 2019 Corvette ZR1 apparently hit 190.1 mph there over the weekend. While 190.1 mph is modest in the scope of Texas Mile speeds like 260.8 mph for a 2011 Ford Mustang Shelby GT500 or 244.2 mph for a 1992 Corvette, the Texas Mile Facebook page said this 755-horsepower ZR1 came to the event’s airport runway completely stock. It also said the folks at Car & Driver brought the car, which has an equally as modest starting price of $120,000, out there. The page said the ZR1 was completely stock, but it also doesn’t look as mean as you’d expect. That’s because after some slower mile runs, the group with the ZR1 decided to peel off the wing that comes on the car for extra track downforce. This ZR1 came to the track with the $2,995 performance package that takes the rear wing from mild to so large that it somewhat resembles a coffee table, and produces a claimed 950 pounds of downforce at speed. The Texas Mile page said it ran nearly 10 mph slower at 180.8 mph with the wing on the back, and that it was in the 190-mph range after a “few tweaks” including the wing removal. That is one fast production car, even if it looks slightly tamer without a giant dinner table on the back of it. Remember to always clean up your taco spillage if you do decide to use that wing as an eating surface, and to keep those 190 mph top speeds on the track rather than on the highway—even if you’re in a hurry. Thanks for the email, Paulo!